Barack Obama is a self-confessed geek. For ghetto nerds such as myself, this is another signal that we have finally arrived at the promised land as a people--a summer filled with great movies such as Batman and Iron Man, and now a Black president who reads Conan and appears in Spiderman comic books. President Obama, has also packaged himself as a super man for our perilous times. He is part Abraham Lincoln, part superhero. In a tight parallel, this fits neatly with the Superman comic and film mythos as Clark Kent/Kal-El's story was also a thinly veiled messianic narrative (boy falls from the heavens; raised by parents who find him abandoned in the wilderness; he demonstrates superhuman abilities). It seems that the Republicans are trying to find their own Superman to resurrect a party that is in disarray and quickly sliding towards irrelevance. The GOP's solution? Michael Steele, the first black RNC chairman--their Superman...their Barack Obama. Ironically, Steele fits perfectly into the Superman mythology. If you recall, in one of the first comic book "events" of the 1990s, Superman was "killed" by a powerful alien named Doomsday. In the vacuum created because of Superman's absence, other superheroes, none with either the gifts or talents of THE Superman, attempted to fill the void as humanity's protector. One of the most prominent of these well-intentioned, but otherwise incompetent superheroes, was a black man by the name of John Henry Irons. He was a gifted engineer and weapons designer, but utterly mortal. John Henry Irons fits the mold of Iron Man in that his heroism and powers are amplified and made possible by technology. Don't misunderstand. John Henry Irons was groundbreaking as an African American superhero--a role made more exciting given the symbolic value of his donning the title "Man of Steel." Even more fitting to the political theater and keystone cops comedic drama that is the GOP at present as it nominates a Black man as Chair, while the actual head of the party is a bloviating, former drug addict, bigot, named Rush Limbaugh, is the other, more often forgotten version of the John Henry Irons character. Who is this you ask? In the same way that John Henry Irons aka Steel was no Superman, Michael Steele, GOP knockoff, the Republican's Black savior, has neither the gifts nor talents of Barack Obama. John Steele, if he is not careful, will like Shaquille O'Neal in the acting world, be the laughing stock of the 2009 political season. Ultimately, if Barack Obama is the Optimus Prime of our generation, Michael Steele is just a Gobot. The character Michael Steel fits better is Bizarro. Lex Luthor manages to snag some of Superman's DNA and makes a clone him that turns out "very badly." 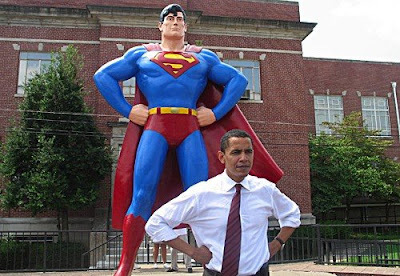 If Barack Obama is Superman, Michael Steel - being created by the GOP (Luthor) in an attempt to have their own "Superman" which is going to turn out very badly - fits Bizarro more than Steel. 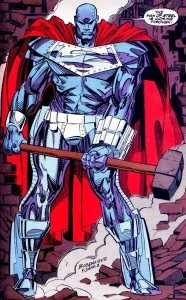 Besides, Steel never makes a claim to be Superman at any point. Bizarro tries to - and fails. Good catch heavy armor...and it works really really well with the Bizarro Universe angle! We did our own Mirror Universe angle during the campaign (we called it the Niggaro Universe)...but this could be a way to bring it back. If you want, please do a guest post on the Bizarro Superman as Michael Steele piece. Great analysis! My first visit here was great. Regarding the selection of Steele as GOP chair... I find the GOP making a mockery of two very important milestones in the US- 1- Hillary Clinton which they mocked with McCain's selection of Sarah Palin and 2- Barack Obama which they mock with Steele. It's like putting lipstick on a pig, right? Or should I say, it's as if they believe they can resurrect their party by treating the American people as if they're stupid... Either way, lipsticked or presumptuous, the GOP seem to be sliding into irrelevance. Ironically this is the same thing that Rove said he was trying to create only in the GOP brand. Karma sure has a sense of humor, eh?